The vision improvement pioneer Dr. Bates said over 100 years ago that vision is much more about the mind than about the eyes. But can we really change the way our minds work? 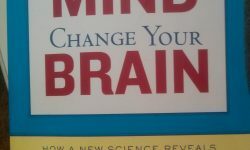 This book describes the fascinating history of scientific exploration into the workings of the brain. 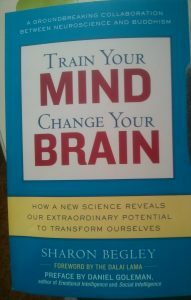 Of major interest to me is that it shows how what we do or what happens to us has a direct physical effect on the brain. Early brain researchers were convinced the brain was hard-wired — the brain you had in your early adulthood, after you finished growing, was basically the brain you were stuck with. They mapped out detailed diagrams of the brain area responsible for sight and hearing and the sensation in your big toe, convinced these couldn’t change. What slowly started shifting that old-school scientist thinking were some experiments into people who had lost the use of a sense. Popular wisdom has said for years that blind people have exceptional hearing, as if Nature is compensating them for the loss of their vision. It turns out that physical brain development reflects this. The brain does dedicate extra neurons to function you use the most. A blind Braille reader’s brain is larger and more developed in the area supporting the tip of the index finger, used to decipher those patterns of close-together raised dots, at the expense of the brain area for the less-used pinkie finger which is smaller. And the neurons in a blind person’s visual cortex, which the researchers expected to have no activity since no physical sight was happening here, are indeed recruited to help augment hearing. Although I’m only halfway through this book, one of the most fascinating tidbits for me was from a rat experiment, which validates something I’ve always suspected. Rats in a “context-rich” environment, with ladders to climb and tubes to scamper through and a few rat buddies to play with, were not only smarter at maze-running and healthier, their brains were bigger! One of the largest rat brain gains came from exercise on a little rat treadmill, as long as the exercise was voluntary. If rats could get on and off the treadmill whenever they wanted, this mattered much more than how often they used it. Rats forced to stay on the treadmill for periods the scientist chose didn’t get much benefit, and sometimes did worse than those who didn’t exercise at all. What is this telling us about forcing ourselves to go to the gym when we don’t went to?! So what did I get from all of this about vision? I noted that the better-than-normal vision in the deaf people studied was not sharper acuity, it was expanded peripheral vision, and increased awareness of movement. This is why the researchers at first didn’t identify the difference, thinking (like many of us) that vision is only acuity. Great peripheral vision is a survival skill, especially if you can’t hear what’s behind you! My overall impression from this book has been one of optimism about the possibilities for growth and learning and improvement, no matter what the difficulty, and no matter what the past has been. I’m envisioning even more of my brain being actively dedicated to clear vibrant healthy vision. I won’t be forcing myself to do vision exercises when I’m tired (thinking of the poor rats forced to run on the treadmill), and will be enjoying my vision whenever I can just by looking around, noticing and appreciating my environment. Use it, or your brain might think you don’t need it, and you could lose it! Next Next post: Am I Blocking Sights From Coming To Me?